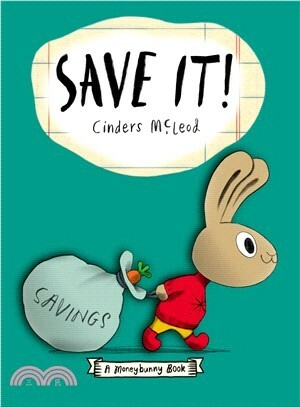 A charming introduction to simple money concepts in which a little bunny learns about the power and satisfaction that come with saving money. Honey earns two carrots a week for taking care of her siblings. Her FIVE siblings who are so loud and bouncy, she wishes she had a place of her own to escape to for some peace and quiet. So what's a bunny to do? Get creative and figure out a savings plan--even if it means forgoing a treat or two. But saving is worth it because with a little patience and perseverance, Honey will be able to make her dream of having her owns space come true! This is the third book in the internationally acclaimed Moneybunnies Series--following Spend It! and Earn It! Cinders McLeod (cindersmcleod.com; moneybunnies.com) also wrote Spend It! and Earn It! and is the creator of the book and comic strip Broomie Law. Her illustrations have appeared in the Guardian, the Express, the Observer, the Independent on Sunday, the Glasgow Herald, Scotland on Sunday, the Globe and Mail, CBC, Macleans, and the Ottawa Citizen. Her work has been recognized by the Society of Newspaper Design, National Magazine Awards, National Newspaper Awards, Advertising and Design Club of Canada, Thames Television, and The Guinness Book of Records. Cinders is also a singer-songwriter-doublebassist, with a CD (Beyond our Means) on Billy Bragg's Utility Label. She lives in Toronto, Canada.